The Glidecam HD-4000 is a Stabilizer System for Small Sized Video Cameras up to 4-10 Lbs. This system is upgraded from the 4000 Pro and offers fine adjustments and an improved gimbal and balance system. 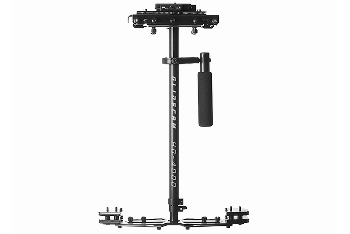 Each HD-Series Stabilizer's offset, foam cushioned, Handle Grip is attached to a free floating, three axis Gimbal. This allows your hand to move up and down, and side-to-side, thereby isolating your hand's unwanted motions from the camera. This up and down movement alleviates the bouncing, pogo type action often associated with competitors systems because their handle cannot move up and down. This design feature, coupled with the overall higher inertia of the HD-Series systems, produces superior stabilization when compar ed with the competition.